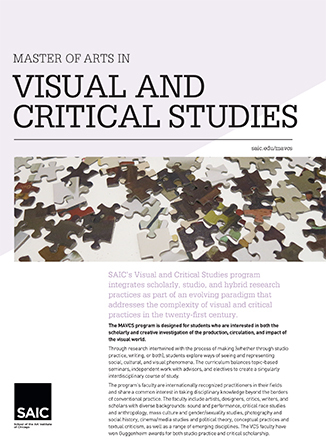 If you are ready to apply to the School of the Art Institute of Chicago's (SAIC) Master of Arts in Visual and Critical Studies (VCS), you will need to first submit SAIC's Graduate Application form and then a corresponding ePortfolio for the VCS department. ePortfolios are required for each additional program to which you wish to apply. All submissions happen via the software SlideRoom. Admission to SAIC is for the Fall term only. Write a 500- to 700-word statement that describes your body of work and discusses how you came to focus on visual and critical studies at the graduate level. Also discuss future directions or goals for your work, and finally, describe how the Visual and Critical Studies program is suited to your professional goals. Upload your statement of purpose to the Attachments section of your ePortfolio. Submit a 10- to 20-page critical writing sample that addresses a particular topic in visual and critical studies. The sample can also be in the form of writings that interpret and/or contextualize an accompanying selection of found images (excerpted from newspapers, magazines, film, or TV). Though not required, it is recommended that applicants with backgrounds in studio art or design submit a visual, audio, or related arts portfolio in addition to the required writing sample. *Please note: Slideroom accepts a maximum of 20 media items, including the critical writing sample. The Department of Visual and Critical Studies does not conduct candidate interviews. Applicants are welcome to contact the Visual Critical Studies department to request an informational interview with the program coordinator at 312.345.3707 or vcs@saic.edu. Completion schedule: Students have a maximum of four years from entry into the program to complete course work and submit a final thesis. This includes time off for leaves-of-absences. Thesis in Progress: Students who have not submitted a finished thesis for review and approval by the end of the final semester of enrollment are given a Thesis in Progress grade (IP). All students with a Thesis in Progress grade (IP) will be charged the Thesis in Progress Fee in each subsequent full semester until the thesis is completed and approved and the grade is changed to Credit (CR). If the statute of limitations is reached without an approved thesis, the grade will be changed to No Credit (NCR). Transfer credits: A minimum of 30 credit hours must be completed in residence at SAIC. Up to 6 transfer credits may be requested at the time of application for admission and are subject to approval at that time. No transfer credit will be permitted after a student is admitted. Graduate Projects: Master of Arts students who are working on studio projects as a part of their degree requirement may enroll in MFA 6009 Graduate Projects. Students are limited to a total of 6 credits of graduate projects over a four semester period. Any MA student wishing to take a graduate project must obtain permission from both the advisor with whom they wish to study and the Dean of Graduate Studies. Students will receive a permission number from the faculty to register for the advisor's section of MFA 6009 Graduate Projects. MA students should meet with their department head to confirm that graduate advising is the type of class they need to fulfill graduation requirements. The Master of Arts (MA) in Visual and Critical Studies program at the School of the Art Institute of Chicago (SAIC) is designed for students interested in the scholarly and creative investigation of the production, dissemination, and impact of visual images, objects, experiences, and practices. With the visual as a starting point, students use multiple methods of critical investigation to study the interactions between visual phenomena and their historical, disciplinary, and social contexts.